If there’s one thing that I do consistently as a business owner, it’s to keep up-to-date with the latest “Must-Reads” from the world of economics. While I’ve never been an Oprah Book Club follower, I do pay good attention to what is trending on social media sites like Goodreads to learn more about what my colleagues are reading. While I enjoy reading new non-fiction, I also have a list of classics that I love. I regularly lend out most of my library, but these 4 “Must-Reads” top the list from the business world. While this may seem like a strange pick for a business book list, this seminal work by Steven D. Levitt and Stephen J. Dubner focuses on how bizarre human existence really is. 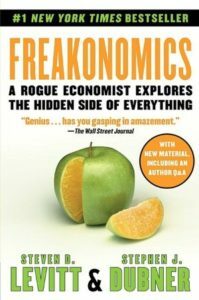 This book is ultimately a study of economics, which is, at its roots, the study of incentives. The authors amusingly and thoroughly research how people get what they want or need in the face of competition and obstacles. The anecdotes by Levitt and Dubner appeal to both my enjoyment of the esoteric as well as my well-developed sense of whimsy. I promise that you will learn while also being entertained. 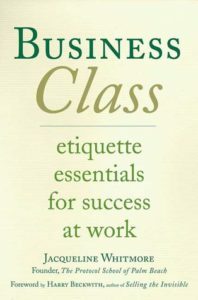 Simply put, Business Class should be required reading for all high school and college graduates before they step out into the workplace. For those of you raised in a very polite family like my own, some of the fundamentals that world-renowned etiquette expert Jacqueline Whitmore discusses in this book may seem like common sense. You are likely in the minority, but we can all do better. Written to be very accessible to CEO or intern alike, Whitmore covers how to mingle, enhance business relationships, and overall leave your business associates with an impressive impression of your skills and attributes. My favorite section covers her recommendations on remembering names – they have never steered me wrong, and continually leave my guests and clients impressed with my care. When you’ve been in the business world for a few decades, you likely have taken all the various type of personality assessments: Myers-Briggs Typology, DISC Profile, StrengthsFinder, and others about which even I may not be aware. As mentioned elsewhere on my website, I’m actually a very big fan of personality assessments in the workplace, because (when done right) it encourages staff growth and development in a productive environment. While on a personal level I love many of these profiling tools, for the purpose of business, I have not found a better one than Strengths Finder. 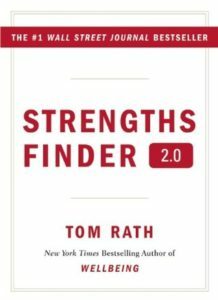 In the book, Tom Rath theorizes that there are 34 primary Strength Areas in which various people each excel, and that it behooves businesses to focus on enhancing their employees’ strengths, rather than always trying to mitigate their weaknesses. When purchasing a copy of the book, you receive a unique code that provides you with an online test that shows you your Top Five Strengths (of course, in the way of things, you can pay more to see your full 34 panel). I’ve facilitated a number of workshops using this model, and find that each time people learn more about themselves and others from this model than any other assessment tool I’ve seen. Once employees understand how their Strengths interact, they can delve further into how they can best team up for goal success. It’s very millennial of me to recommend this book, but don’t discount it as an “everyone gets a gold star” message. Rather, it focuses on how your business is improved when employees are best being used. It’s a classic for a reason: thought the examples may change, people do not. Values like putting other people first, listening to their needs, and working to find consensus have only continued to grow in their relevance to the modern workspace as Baby Boomers and Millennials especially learn to co-exist. Every employee that I’ve ever seen leave a job has come down to how much (or how little) attention their manager was paying to what they did. As a manager, you cannot always be the one who says “Absolutely; you are doing a great job.” Sometimes, you owe your employee more than a pat on the back to provide them constructive guidance. Sometimes, they may not have met your expectations for what they need to make happen. You can, however, choose how that guidance is given and reflect upon how it is going to be received. While the outcome may not always be positive, you will rarely go wrong with the guidance from this book. The key to this article is that a business leader should cultivate a culture of learning – for themselves and for others. Every successful businessperson I know has the same habit of being a constant learner. Encouraging your employees to develop their own “must-reads” list, while sharing yours, can be a delightful experience. If you aren’t much of a reader, audio book subscription sites like Audible have made listening to business books incredibly accessible to all. 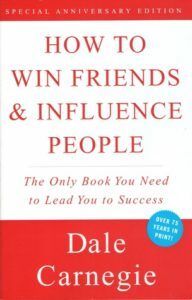 What do you plan to read in 2019 to develop your business skills? I’d love your recommendations too!